In some ways, linen is the “third fabric.” Men are familiar with cotton from their button-downs, tees, and pants, and know wool because it’s spun into their work suits and winter sweaters. Though it’s is one of the oldest known textiles, we’re not so familiar with how to wear linen or take care of linen as our toga or tunic-wearing ancestors once wore. But that can change, starting with this short list of Do’s and Don’ts. Follow these guidelines to let a little linen into your life, beginning with tailoring. One way in which linen gets a bad wrap is its tendency to wrinkle. That’s not so much a problem as it seems, which we’ll discuss below. But it is true that it’s more likely to rumple than other fabrics, and serious creases are to be avoided. To do so, hang up your linen suits with care. Make sure the pants are hung smoothly, and that the suit has enough space in your closet so that other garments aren’t pushing up against it. Linen is guaranteed to wrinkle, and you should let it. While an occasional steaming will do it good, don’t feel like you have to do so after every wear. 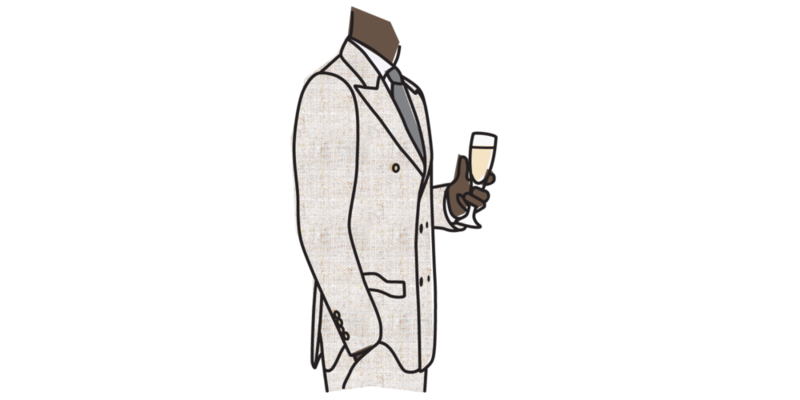 Instead, embrace the rumpling and the casual, lived-in feeling it gives your linen suits. The more open weave and rougher hand-feel of linen makes it an easy companion to a pair of jeans (yes, the wrinkles help too). Feel free to break up linen suits and pair with your favorite jeans. A navy linen jacket with light denim never fails. Bright colors can look a little more alarming in wool or cotton, but the nature of linen gives color a softer, cooler, and more saturated look. If you’ve ever imagined rocking a suit in bright blue, moss green, or sand, linen’s a great opening to do so. Linen is breathable, lightweight, and quick-drying: three qualities you’ll appreciate at any wedding that takes place between May and September (particularly after you’ve been pulled into the dance floor). What works so well for summer nuptials doesn’t necessarily translate to the boardroom—and that’s ok. If you’ve already got a dark wool suit for your 9-5, make linen your second and have fun with it.